Home / Index category / Cristina Neagu is NBSC World Handball Female Player 2018! 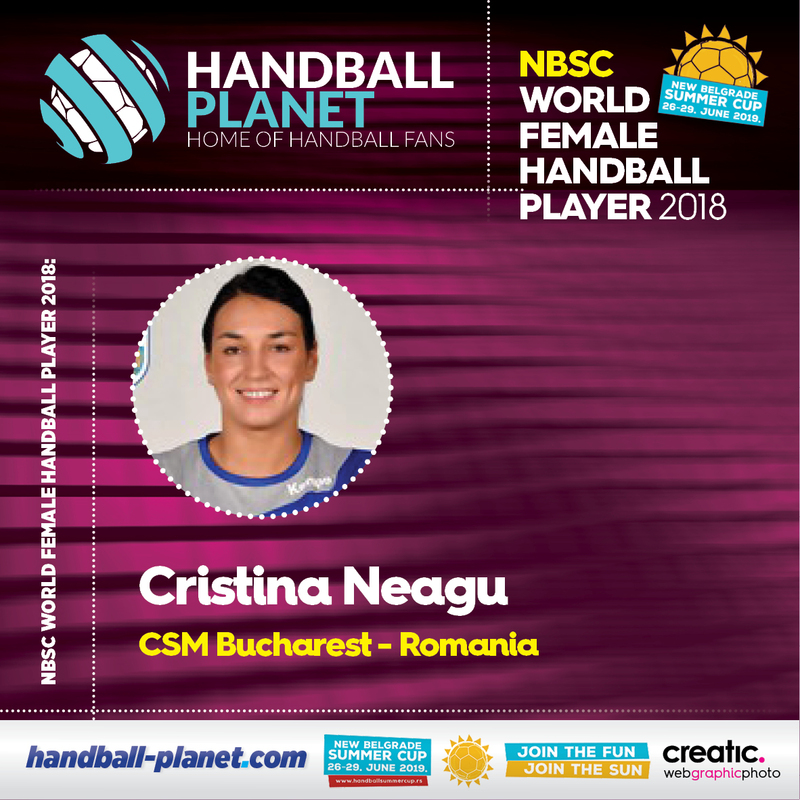 Handball-Planet.com is proud to announce that Romanian superstar – left back Cristina Neagu is the WORLD FEMALE HANDBALL PLAYER 2018 powered by New Belgrade Summer Cup. The 30-years old righthander of Romanian national team and CSM Bucharest got the biggest support of Handball-Planet.com Jury consisted of handball Experts (12 handball journalists from 12 countries) together with the fans from all over the world who took a part in voting choosing from 32 nominated players on eight positions. Cristina Neagu was a leader of Romanian national team almost until the end of successful campaign at EHF EURO 2018 in France, where they ended at fourth position, but also with strong influence of the results of Romanian champions CSM Bucharest. With 48 points in total, Neagu put behind French goalkeeper – Amandine Leynaud (44) and Russian right back Anna Vyakhireva (42). Neagu won the award for the third time (2015, 2016 and 2018) just like Heidi Loke (2011, 2013 and 2014). Zsuzsanna Tomori (2012) and Nora Mork (2017) are also on the list of Handball-Planet.com winners. ← Previous Story Uwe Gensheimer to TAXI driver: Take me home! Neagu won the award for the third time (2015, 2016 and 2018)? She won the award …forth times 2010,2015,2016 and 2018. Pingback: Női kézi: négy győri játékos a szaklap álomcsapatában – HírZilla – Minden hír egy helyen! Pingback: Doar in cazul in care interesează pe cineva: avem cea mai buna handbalista a lumii, pentru a 3-a oară consecutiv!